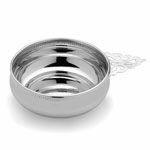 Feed baby in style with this pierced handle Empire Beaded Border Sterling Silver Porringer, featuring a beaded border encircling the top lip. 4" diameter, gift box included. Also available with a plain border.